The purpose of the article is to characterize the development and specific features of inflation in Russia on the basis of its theoretical justification and practical analysis. The article discusses the monetarist and Keynesian approaches to the characterization of inflation. The paper shows that the equation of exchange from the quantity theory of money, which is the basis of the monetarist theory of inflation, does not allow to make an unambiguous conclusion about the direct relationship between money supply and price level in the economy. The authors give the theoretical substantiation of cost-push inflation from the position of microeconomic theory, which is denied by the representatives of the monetarist school. We characterize the specific features of inflation in the period of market transformations in Russia. The article shows the considerable role of the cost factors of cost-push inflation: the monopolization of the economy, rise in the prices of energy and raw materials. There is an absence of the direct relationship between inflation and money supply growth in large part of the period of the 2000. The authors determine the dependence between the exchange rate and inflation in the Russian economy, which is most evident during periods of significant devaluation of the national currency, as a rule, associated with a significant increase in world oil prices. The paper notes that the significant decline in aggregate demand that occurred in Russia in recent years have reduced the level of inflation in 2016. Despite this, the reduction of inflation and its transformation to slow cost-push inflation was combined with negative consequences for the economy: the decrease of investments and production development, reduction of the living standards of the population. The authors conducted the analysis of inflation on the level of the subjects of the Russian Federation, which has confirmed the significant role of causes of cost-push inflation in the economy. The research has led to the conclusion about the appropriateness of measures on the stimulation of aggregate demand and the development of the national economy by reducing interest rates, increasing investment activity, developing competition and efficiency of antitrust regulation. Socio-economic development of a territory is particularly important in the context of the Russian society globalization, the acceleration of innovation, the emergence of new markets, increased competition for resources, as well as in the situation when consumers become the main factor determining the principles and methods of modern competition. Therefore, it is relevant to define the level of competitiveness of economic actor. The paper considers the criteria for the development of the consumer market’s retail segment. Furthermore, we have developed the model of competitiveness of local economic actors in the retail segment of the consumer market on the example of the Sverdlovsk region. As a result, we have formulated the conceptual framework for competitiveness of local economic actors in consumer market’s retail segment. Retail trade has socio-economic significance. Thus, there is a need to develop a consolidated framework for the competitiveness of economic actors in consumer market’s retail segment. Theoretical and practical experience of national and foreign researchers in this field has allowed us to suggest our position on the investigated problem. It is based on four components. The first one is theoretical foundations of the basic concept of competitiveness. The second component is the system of accounting and analysis. Thirdly, there are the system and methods of financial analysis. And the last component is the shareholder value model (EVA, VBM, DCF). The authors’ conceptual framework is based on the theoretical and methodological foundations of modern innovative tools for the financial management of competitiveness. The results of the research can become a basis for the development of new conceptual framework for the activities of local economic actors in the retail segment of the consumer market. It will ensure their effective strategic development. 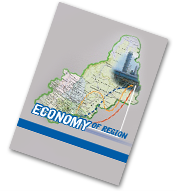 The choice of economic policy instruments to ensure economic growth is one of the important problems of the country. The purpose of the article is to analyze and characterize the interconnection of income, inflation and aggregate demand in the Russian economy and at the regional level in order to increase the effectiveness of the state’s economic policy. We show the contradictory causes of demand-pull inflation and cost-push inflation, as well as anti-inflationary measures aimed at overcoming them. The hypothesis is that the decline in inflation results from tight monetary policy and the use of monetary measures. The decline in inflation have negative effect associated with a reduction in aggregate demand in the economy, a slowdown in economic development or decline in production, a decrease in investment and innovation activity in the country, a decrease in real incomes. Based on the analysis of tabulated models, we have determined functional dependencies between changes in household incomes, inflation and aggregate demand. We have revealed that there was no unambiguous correlation between the money incomes of the population, investments, government spending and changes in the level of inflation in Russia. Moreover, the increase in total spending was more often accompanied by a decrease in inflation than by the development of inflation processes. We have concluded that the transition to the state policy of stimulation of cumulative demand is appropriate. The results of the research can be used when developing the state economic policy and regional programs aimed at ensuring the economic development of territorial subjects of the Russian Federation.